Michael Noonan says he is considering bringing in outsiders to help him enforce the findings of a review of banking salaries. 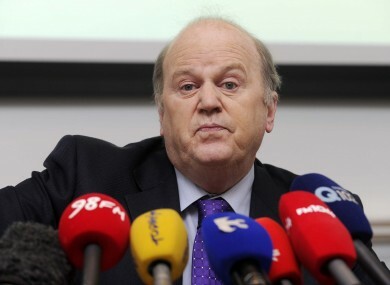 FINANCE MINISTER Michael Noonan has revealed he is considering bringing in “outside expertise” to examine how he can cut the salaries of senior staff at the state-owned banks. The news comes as progress stalls on a Department of Finance review of pay at the banks in which the State has a stake. The review began last April when Noonan asked the state-owned banks to consider measures which would encourage staff to take lower salaries and benefits in the current economic environment. The review was being carried out by the National Treasury Management Agency, on behalf of the department, and although work is ongoing it is understood that political input is now being sought on how the review should proceed. Noonan told Fianna Fáil finance spokesman Michael McGrath said he did not consider it appropriate to publish “incomplete interim data” from the review, which aims to compare pay and conditions across the state-owned banks. “I am currently examining how best to progress the review and am considering utilising outside expertise not currently available to my Department to promote the efficacy of the findings and outcomes of the exercise. Noonan’s review is also expected to include proposals on tackling severance arrangements, and was initiated around the time it emerged that the former AIB managing director Colm Doherty had retired with a package of over €3 million in November 2010. He had only served ten months in that role, being paid €432,000 for his work – but was then given over €700,000 in lieu of his years’ notice after his contract was terminated on the insistence of then-minister Brian Lenihan. On top of that, Doherty was paid €2 million in lieu of contributions to his pension. Enda Kenny pledged, after Doherty’s payoff came to light, that the boards of the country’s state-owned banks would be overhauled – but knowledged that laying off senior directors would likely come at a major cost. Bank of Ireland is the only domestic bank not in majority state control; the state owns all but a small portion of AIB, which now incorporates EBS, and has fully nationalised Irish Life & Permanent. Anglo Irish Bank and Irish Nationwide, both of which were previously nationalised, have been merged into the Irish Banking Resolution Corporation which remains wholly owned by the state. Email “Noonan considering 'outside expertise' in quest to cut bankers' wages”. Feedback on “Noonan considering 'outside expertise' in quest to cut bankers' wages”.